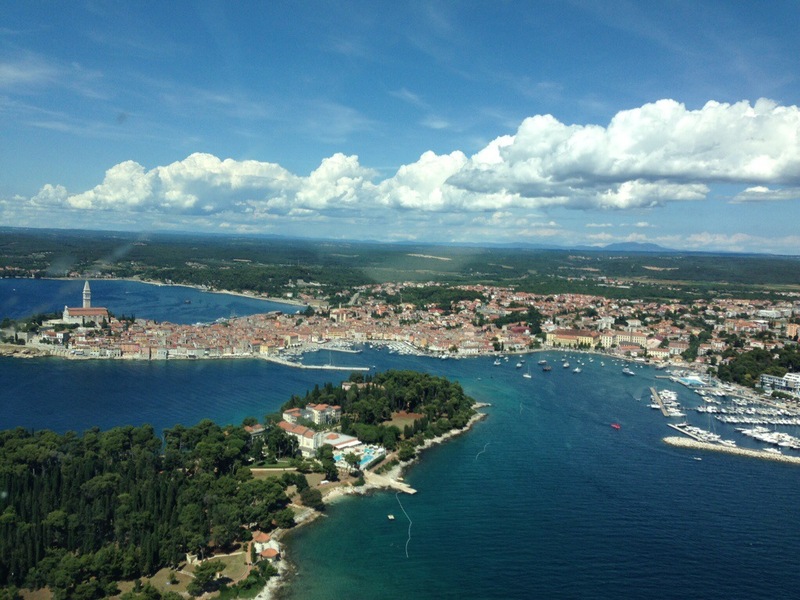 I was just on holidays in Croatia with my family on the part called Istria. Istria formed eaerlier a part of Italy and you can clearly see the ‘touch’ of the italian architecture on the buildings, cities and villages. The nature is very green, the sea blue (as it should be 🙂 ) and there are also some nice small islands not far away from the coast which would be nice to see from the air. Before we went down I made a small investigation on internet about the flying clubs, possibilities, etc. The information found on internet about flying in istria was equal O, or very poor information in croatian, which doesn’t help a lot. If you are not on internet, you doesn’t exist! It is also a good experience to fly in a different regio than you are normally used to fly to gain more experience and to see how is the world of aviation in other countries. After arrival we spoke to the owner of the place we were staying at, and he gave me some information about a field from where some local company offers touristic flights… There was some hope that I would be able to fly around and log my first flight with a plane with croatian registration and croatian airports into my logbook. The field is called Medulin Aerodrome (LDPM) and has a grass strip (RWY 12/30) and a concrete taxiway. It was very easy to find it, as they have exposed 2 written off planes on the hill, Piper Aztec and Cessna 150. They were from the local flying club which went bancrupcy. So at least somehow they are still serving for aviation purposes as a “decoration”. After we spoke to the owner of the company we were able to make a flight on our discrection. As the hour costs 220€ in a Reims 172, I decided to fly only one hour only. The one hour was sufficient and really worth of it. Could have been flying for longer, but it was simply to expensive. The owner flew with us as a security pilot and he gave us a lot of interesting information about the area and helped with the communications and navigation as well. The weather conditions and visibilty were outstanding with almost no wind. The plane was refueled for approximately 01:20 hours and my question was: where is the reserve? He said, we have 3 airports near by and we are going to fly for one hour only, so it should be sufficient. (Checked the 2 tanks, and the right one was almost empty). This is probably how they are flying the touristic flights as well… Hm, have my doubts about the correct procedures and the safety of the flight. Was not sure whether to abort the flight or not. Finally I decided to fly anyway and to hope that everything goes fine. (I did fine, otherwise I wouldn’t be writing now this post, lol). The taxiway was from concrete and exactly as bright as the the Cessna’s landing gear, so I had to look good to stay on it and to not to taxi on the grass. Finally I thought we were going to depart from the grass strip, but following the owner’s instructions, after pulling the throttle to maximum, we were able to take of from the resting taxiway on the 160 meters… Wow! Airborne pretty fast! 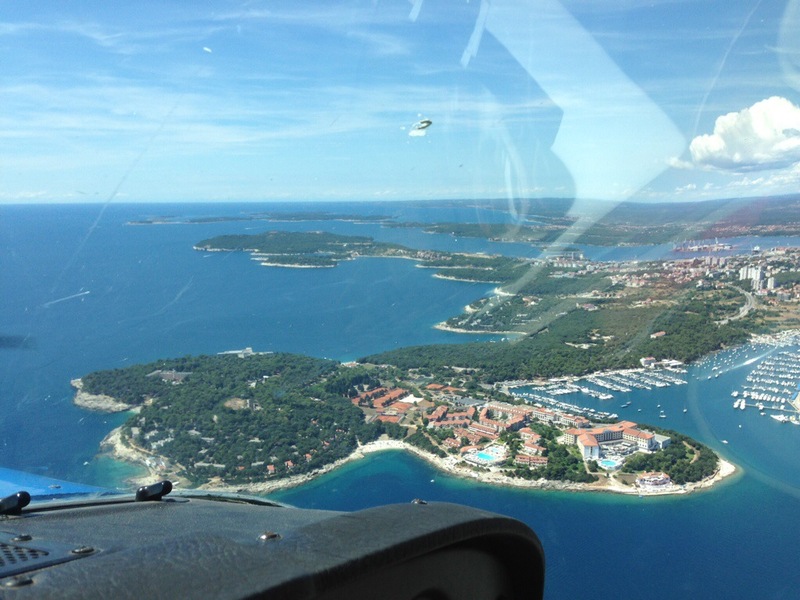 Next we crossed Istria to the west coast, than to the southeast and continued with our 2nd low pass on Pula Airport (LDPL). After the low approach we have returned back to the Medulin aerodrome (LPDM) for landing. Approaching at 65 kts with flap 10′ we have landed on the grass strip (RWY 12). Pretty nice experience to land on a grass strip (I am used to land on a concrete runways between 1.800-3.400 mtrs long). I have enjoyed the flight a lot, also the coutryside and the experience. 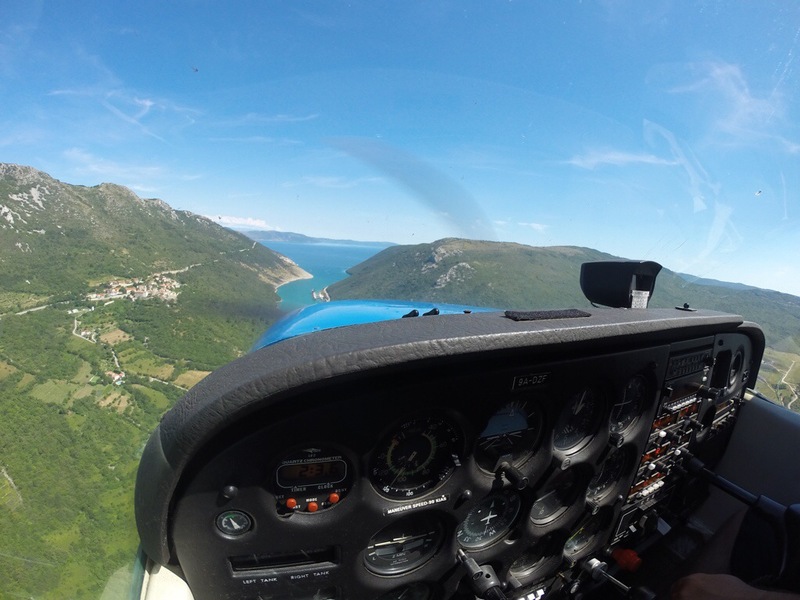 I am sure I would repeat it again and fly over to some othe parts of Croatia. I have to admit that the owner knows very well his plane and the area, and it was a nice flight and experience. Here I share with you a short video from my short field take off at Medulin Aerodrome using the remaining 170 mtrs of concrete taxiway 🙂 Enjoy it! We were flying with my friend around the island, he is a commercial pilot and instructor as well; and it seems that the flight was a bit “boring” for him without making any manouvers, stall recoveries, etc. So he just asked me during the flight: “Can you make at least some stall or something to make it a bit more entertaining”? 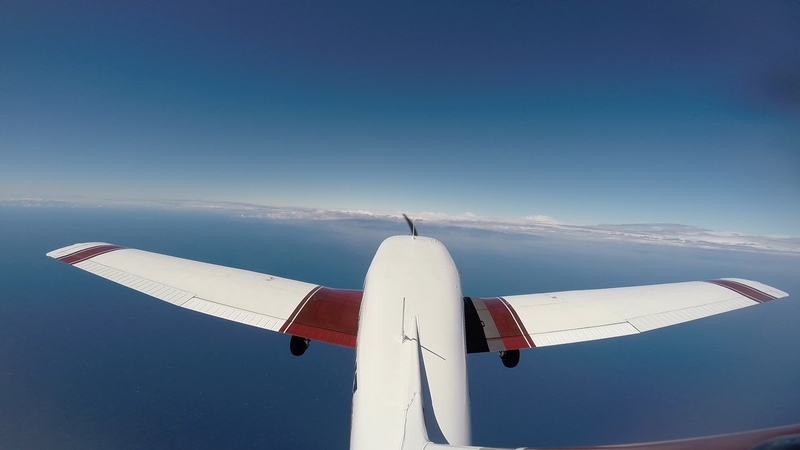 My response was pulling back the throttle maintaining the altitude with the yoke and centering the plane with the pedals until the Cessna stalled, followed by the recovery. It is pretty amazing, how difficult it is to stall a Cessna, it stays simply hanging in the air… If I compare it to the P28A which I use to fly more often, the Piper would be a piece of a brick falling from the sky 😀😀😀 comparing to the Cessna. Somehowe after this couple of flights I am starting to like the Cessna as well. I have recorded the stall recovery with the Gopro mounted in the cockpit; unfortunately forgot to delete the files from the Gopro hanging outside on the wing, so I was only able to take 2-3 pictures (grrr) with it. It was hanging outside for nothing (creating more drag). I will have to create my personal “gopro checklist” haha before going out for flying to avoid bad surprises like this one. However, I like those 2 pictures i’ve taken… Quality before quantity (a good excuse), haha. The first and probably best option to avoid ditching in the sea was a golf course. We were gliding from 4’500 feet for a while and were trying to calculate the approach taking in consideration the weather conditions, etc. (we had a tailwind, so after the final turn we could be short of the field and…. do not think about the worse…). When on the final of the golf field (almost with the golf players in sight), we have performed a go around and continued with the island tour. It was a very good excersise; sometimes it is necessary to go back to the basics and train the emergency procedures. The funny thing is that a couple of days later a friend of mine who was playing on the course that day asked me: “Were you flying on saturday?” I answered, yes, it was me 😀😀😀. “I was thinking to hit you with the ball”, he said… I thought probably he recognized my flying technique ;-). The most of us are flying to enjoy the 100$ hamburgers. In Spain we could speak about something similar, as for example “100$ paella”. My last flight went to La Palma, together with my friend Daldo and his wife Virginia as passenger. I was flying the inbound leg and we were cruising at 8,500-9,000 feet. Pretty nice views over the Atlantic Ocean, the sea was very calm, but we were having some headwinds of 20 kts which made this flight a bit longer and of course a bit more expensive ;-), that is why I speak about 200€ paella ;-). Actually I enjoy flying high(er), as there is normaly less turbulence and you can enjoy better views. Also, in the case of an engine failure, the range of possibities of gliding or trying to restart it, are better, as you gain time. And also, you feel like you are flying a real arliner ;-). So there are only a advantages of flying at higher altitudes. The icing was forecasted for this day at 9,000 feetm the OAT was around 2 degrees, but no ice was forming on the wings. We were cheching it constantly, for just in case, however we were not flying in the clouds and the day was pretty sunny as well. Reaching La Palma island we have maintained 9,000 feet and made some cloudsurfing. The weather forecast for today was some rain and also a front was comming from NW. We have decided to do this flight anyway, as the visibility was ok, no clouds were in sight, and in the case the weather would starting to change, we would return back to our base airport. After this short cloudsurfing, we have started our descent to the visual point Sierra, in the south of the island. Being so high took as a while to descent and make some nice manouvers between the clouds. Finaly after 1,30 hour long flight we have landed at the La Palma’s “El Mazo Airport”. This airport is considered one of the world’s most complicated approaches, however with its 2,2 km long runway it is nothing special for our Piper ;-). Our Piper was parked as it should on a nice place, where even an Airbus 330/340 could be parked. A realy big honor for this plane ;-). We knew, that we had not much time, as the storm was comming sooner or later, so we have decided to go quickly to the restaurant Casa Goyo, situated under the extended centerline of the runway, just between the extended centerline´s lights. They have a lot of specialities, good quality-price relationship and also very good seafood. This restaurant is situated in a walking distance from the airport, some 10 minutes. This one is better 😉 Waiting for the paella. After the lunch we took a taxi (6€) and we hurried up back to the airport to pay the taxes (18€), made our new flight plane and departed direction Tenerife. There were pretty much clouds than earlier this day, so Daldo had to climb up to 10,000 feet and fly around the clouds to avoid them. The views were even more spectacular. Cruising at 9,700″ Pretty awesome, isn’t it? Only a couple of minutes later after our landing, when the plane was parked outside the hangar, it started to rain and the visibility dropped down significantly. This was a perfect planning, in the other case we would have had diverted to the alternative Tenerife south airport. 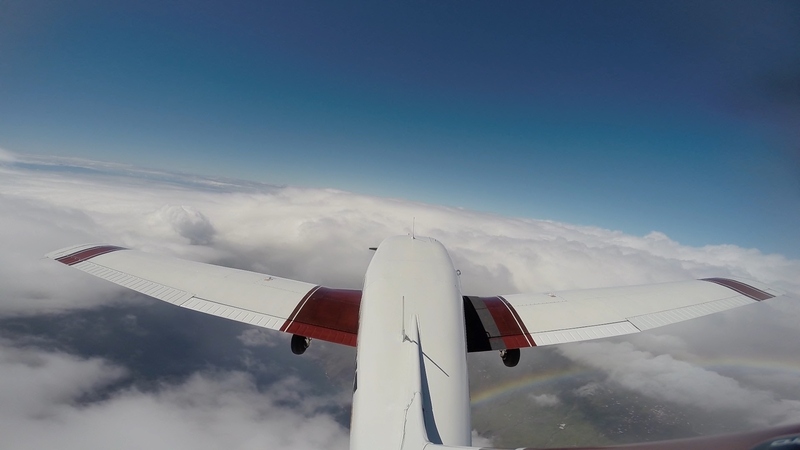 A short video of the descent, cloudsurfing, approach and landing at the La Palma Airport. The Gopro has been mounted on tail of the plane. It has been a while since my last flight, the meteorology was not the best one, so I had to wait long to get airborne… Then maintanence on the piper had to be done so I´ve decided to fly again the club´s Reims 172. I have purchased a second Gopro, this one is the latest model Gopro Hero3 Black+ and the difference between the White and this one is huuuuuge! The quality of the picture is much much better than of the White model. They shouldn’t be selling this model (white), as it is realy bad. Today there was a very nice visitor to the Tenerife North Airport; the Beechcraft B-200 Super Kingair, privately held, was resting on the ramp. The plane was there already for a couple of weeks. My today´s flight was scheduled with the club´s Reims 172 (the european version of Cessna 172). The last time I flew Cessna was 13 months ago… So why not to try it out again, to enhance my flying experience? The new Gopro Hero3+ was installed inside and connected to the Intercom to record the ATC communications, which worked perfectly. Here you can see the connection between the camera and the Intercom to record the ATC communications. To see, what do you need to connect it, you can read more in my previous post. 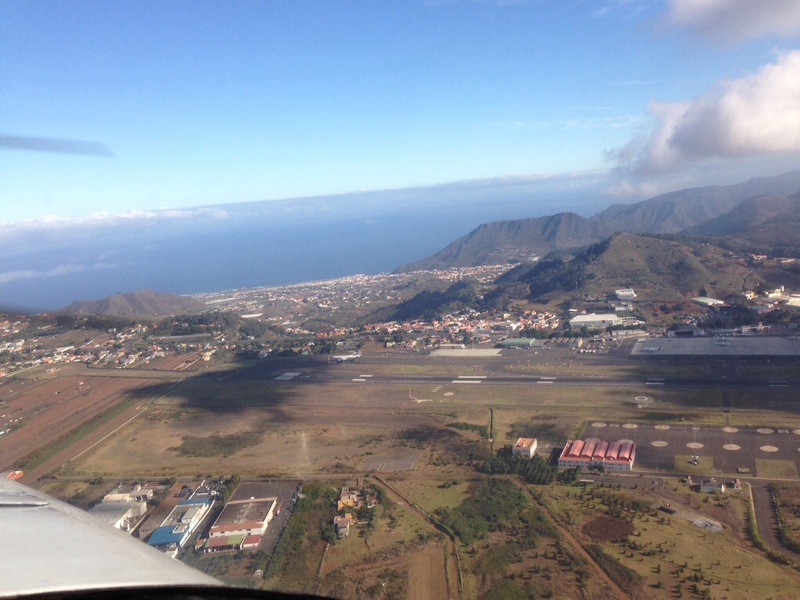 My last flight was to the island La Gomera. La Gomera is a small airport on the Canary Islands. When you approach the runway, it seems like you are going to land on an aircraft carrier (with a little imagination ;-)). The runway is long enough to land with a Boeing 737, but the biggest planes landing there are from the local company called Binter usind ATR72 aircrafts. The landings can be sometimes challenging, as the airport was built not on the best place (but there are no other options), so you can have a headwind over the threshold, 90 degree crosswind in the middle, and tailwind at the end of the runway. So you have to take care when landing, otherwise the plane can suddenly drop down. On this occasion the weather was quite nice, some crosswind, but the landing was pretty smooth. Here is a short video of the approach and the landing from a wing wiev. I have mounted my gopro this time on the wing trying to capture the plane and the runway. So on my last flight last week with Piper P-28A Cherokee Archer ii (reg. EC-JMT), I have decided to practice stalls, touch and goes and some other manouvers and to have fun. The weather was perfect, wind calm and it was a very nice experience. And I feel safer again. I have made a lot of stalls, recovery with or without engine, steep turns and also a zero gravity flight. After this take off the ATC has notified 3 planes arriving, so I have proceeded to the visual point November for manouvers. After some manouvers I came back to the airport for more touch and goes. In total I have made 5. My second landing was just a normal approach on the glideslope with 1 point flap. Of course, normally nobody does this kind of landings with passengers 🙂 Safe landings! My last flight was a little bit different. I do mostly crosscountry flights, so there is no time to make manouvers like stalls, touch and go’s, etc. Probably the passengers would get scared to death, lol ;-). This time I have decided to spend the time in the air practicing stalls, turns, touch and go’s, with flaps, without flaps, slips, etc. I was lucky to have a perfect weather, almost no traffic and wind calm, so I was able to enjoy a really nice views and a flight without turbulence. After departure I have proceed to a visual point November and where a bunch of stalls and turns a zero gravity flight was waiting on me. After a coupple of stalls, steap turns, slow flight, etc. I have decided to try again a zer gravity flight. It was a pretty long time ago that I have practiced this. 3.000 feet above the sea with fuel pump on I have lowered the nose to pick up the speed to approximately 120-130kts, then started to climb and pulled back down the nose to feel the zero gravity. It worked good out, but my Iphone flew on the backseat so I had to search it, otherwise i wouldn’t be able to make more pictures on this flight. After the third one I have retourned back to the airport for more touch and go’s. It was a nice day full of practice, I am sure I’ll repeat it again… Safe landings!